I was looking for a blog opp today and was thinking Tullulah's in Bayshore, but familial consensus brought us to Avocados out in Bayport. I've heard of Avocados through word of mouth; it's a Mex-American Grill serving Cali-style burritos, tacos, quesadillas and the like. Emeline says that it is considered competition for Bubba's, but even considering my low expectations radiating from their dire looking website, I left Avocados disappointed. The four of us ordered soft tropical shrimp tacos, hard fish tacos, a pork taco, a chicken quesadilla with jalapenos, three empanadas and chips and salsa. The counter-girl was not particularly friendly but she was steadily busy as a line formed to order behind us. Our order with four water bottles came to $56. Better be some pretty good tacos. The chips and salsa came out first. 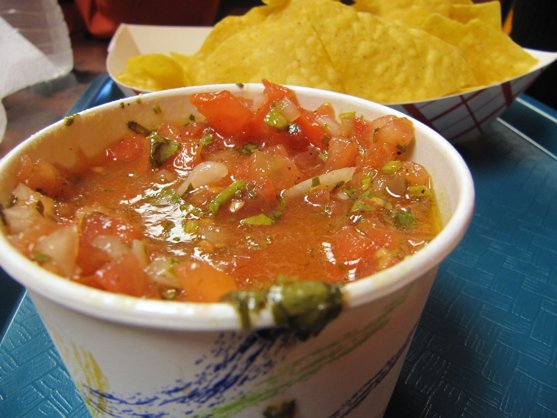 The salsa was pico de gallo style and seemed fresh but was entirely too acidic. I couldn't get past the bitter taste. Our tacos and quesadilla came a few minutes later. Instead of the tropical shrimp tacos with mango and pineapple which I wanted to compare to Bubba's, I was served classic tacos with shrimp, which meant more of the acidic salsa piled on top. There was a decent amount of shrimp, cheese and lettuce, but all I could taste were the tomatoes. Mom's fish tacos had the same toppings over chopped, fried fish. The hard taco shells were comparable to Ortega from the grocery store; they would have benefitted from some personal touch. 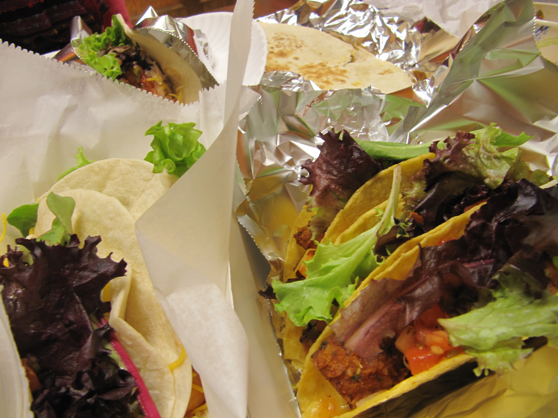 All of the tacos, including the pork, were bland and boring with a severe lack of seasoning and flavor. Mom thought it was weird to have mixed greens on top of the taco instead of typical iceberg. Dad's empanadas came out last and sent shock waves across the table. They were electric red and looked like the texture of a corndog. 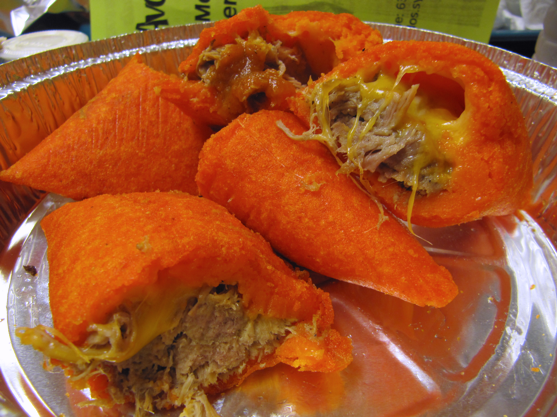 There were filled with shredded pork and cheese and were served with some kind of red sauce, but they were super doughy and seemed frozen. They bore zero resemblance to any empanadas I've ever had or seen. Four years in the Bronx taught me how an empanada should be and Avocados has it wrong. The only item on the table we all agreed was fine was Em's quesadilla. Not much room for error with chicken and cheese melted in a folded tortilla. It was quite large and cooked well. Besides the unimpressive food, the ambiance at Avocados suffered. The unappetizing orange walls were dirty and the space was cold. The TV blared behind me and the few tables were bare of napkins or hot sauce. Someone on Yelp said that Avocados takes a safe route with their menu, and I agree that nothing was inedible; it was all just excruciatingly boring. So boring I almost fell asleep mid-chew. Plus, for a name like Avocados, I sensed a devastating lack of the namesake fruit. I wonder if the attraction to this place is in the burritos, but if they can't do a taco, I can't imagine anything amazing happening in burrito form. This wasn't worth the ride to Bayport or the money.